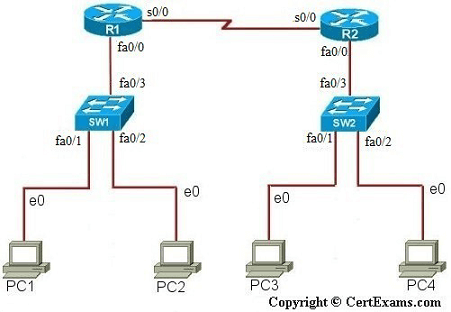 Description: The purpose of this Lab is to configure NAT on the Destination router (NAT outside source) and the source router (NAT inside source) test for connectivity by pinging a remote router. You need to assign the IP addresses and make the interfaces up (by issuing no shutdown commands at appropriate interfaces) for all the devices before proceeding with the commands. Note: Please refer to the CertExams.com Network Simulator software for complete lab with commands.